I find myself wanting to draw in pretty much every meeting I have. Many of these meetings take place virtually, using whatever video conferencing software my clients prefer. Drawing on an iPad is a whole lot better than physical whiteboards or the draw functionality built in to many conferencing apps, as long as you know how to do it well. 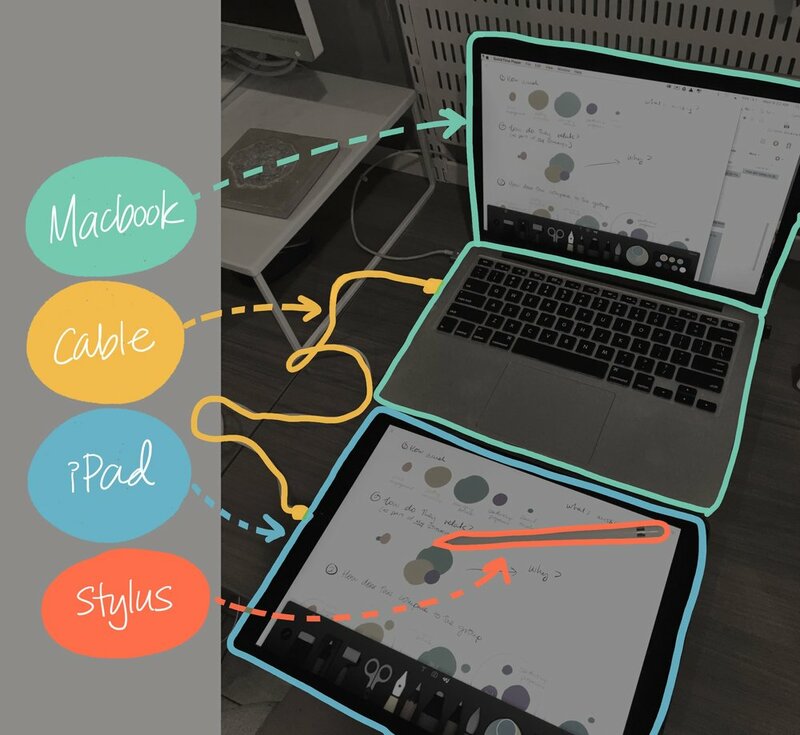 Over the past two years I uncovered a fool proof system that works in any situation and on any software-- all you need is a Macbook, your iPad/stylus, and a connecting cable. If you want to try this out, I would suggest doing a dry run of the steps below with a friend before trying this in a high stakes meeting. Using Airplay doesn't work for two reasons: reliability and lag time. Joining direct from your iPad doesn't work either-- if you join a Zoom conference on your iPad, for example, you can only share from a small selection of apps-- drawing apps are NOT included. With your iPad connected via USB, open QuickTime. Go to File and select New Movie Recording. A display will pop up, and it might show your webcam. If so, click on the small arrow by the record button and choose your iPad as the camera. Now your iPad display should be mirrored on the computer! Log in to your video chat session to get started! STEP 6: Let me know if you have a better way! This isn't the easiest process, I'll admit. It takes a while to get the hang of all of the steps, but I haven't found a more reliable alternative. Do you have any ideas? Share them in the comments or send me a tweet!